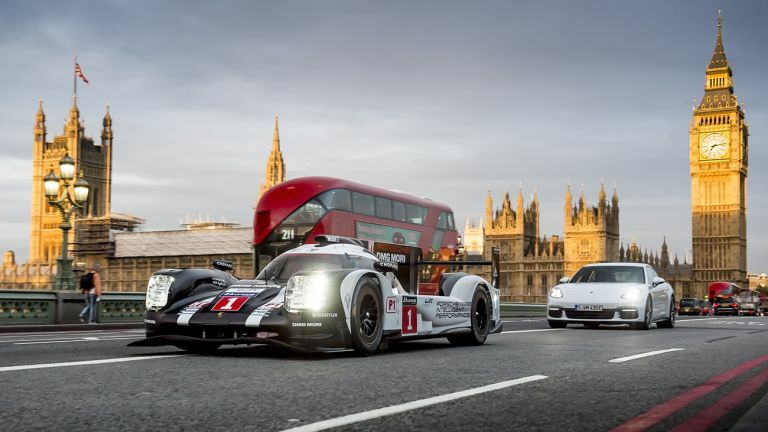 Why did Mark Webber drive the Le Mans winning Porsche 919 Hybrid through the centre of London? Early this morning (and we mean early, we've never seen London so quiet), Mark Webber climbed into the cockpit of the Le Mans winning Porsche 919 Hybrid for a quick spin around London. To showcase how Porsche is translating its race-winning Hybrid technology from the track to the company's road cars. At the heart of the 919 Hybrid LMP1 lies a two-litre, V4 turbocharged 500 hp petrol engine that drives the rear wheels, which is assisted by two innovative ERS developing over 400 hp on the front axle. It's quite a machine, which looked and sounded amazing on the streets of Westminster. Alongside the 919, Porsche's new Panamera 4 E-Hybrid, made its global debut on the streets of London today. The Panamera 4 E-Hybrid pairs a 330 hp V6 twin-turbocharged combustion engine with a 136 hp electric motor. Just like the 919, the newest road car combines high performance with high efficiency. The Panamera has the ability to drive up to 31 miles in pure electric mode (and reach a maximum speed of 87 mph) or use both powertrains to increase performance or efficiency. It'll hit 0-62 mph in 4.6 seconds, and go on to reach 172 mph top speed.